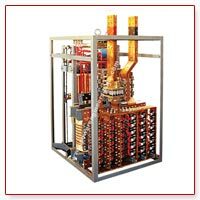 Electroplating Rectifiers is an equipment that converts AC into DC supply. Power make Silicon Rectifiers are widely used in Electroplating, Anodizing, Hydrogenation and all other electrochemical processes. 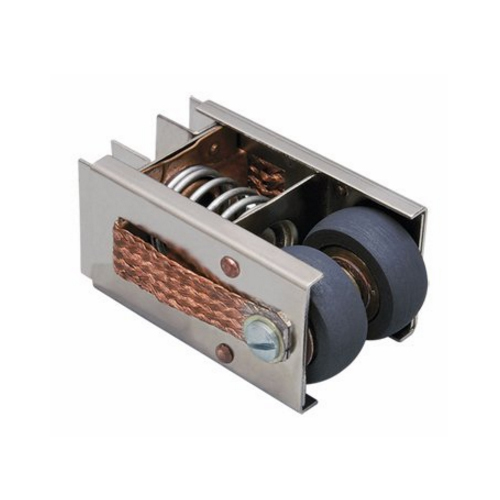 These power rectifiers, anodizing rectifiers and electroplating power rectifiers are tailor made, covering a wide range from 200 Amps to 15000 Amps at different output DC voltage as per requirement. 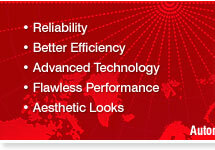 Liberal Design Rigorous Testing of the Equipment Enables Trouble Free Service for Long Life. In plating application the regulator is better and technology is adopted in Germany and Europe because of as explained in advantage. Other manufacturers of rectifiers have shifted to thyristors because they do not have the technology of rolling carbon roller regulators. 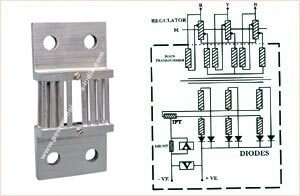 Manufacturers of electroplating power rectifiers claim that thyristor controlled rectifier has less losses than regulator. They compare thyristor with sliding carbon type regulator. In our case their claim is not true. We use vertical coil type rolling carbon regulator. The copper section is three times so the losses are almost 1/6 or 20%. In our regulator the roller moves on both sides of the coil to give ± 440 V or ± 254 V output. We design the rectifier in 'Q' connection in which the regulator current is half the line current so losses are less and life is much more. 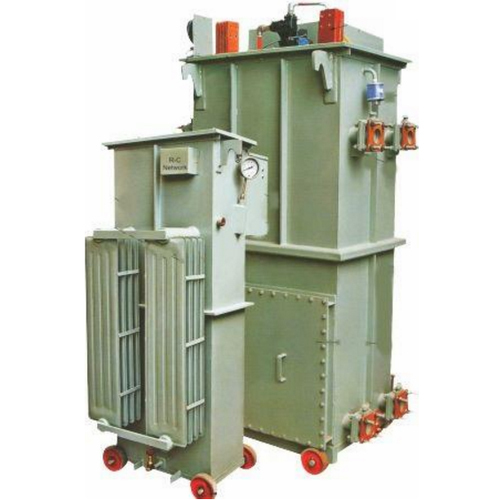 Electroplating Power Rectifiers are designed for 3 phase 50 Hz. AC input supply & are available for operations at any voltage between 380 and 440 volts, in India but can be designed for 60 Hz AC and any other voltage available. 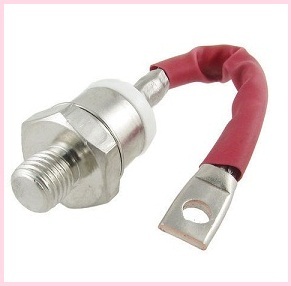 It is recommended that the input to the rectifier should be connected through a proper protective device, to provide positive protection to personal and the system, in the event of maintenance or in case a fault occurs. 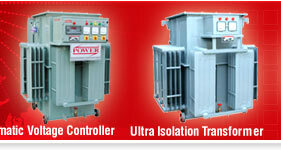 Also manufactures rectifier auto transformer. The function of the variable output controls is to control the voltage or current or its operating range by varying input voltage to the main transformer primary. The DC output voltage variation is achieved steplessly 0-100% by means of an On Load roller type power make voltage regulator. No. 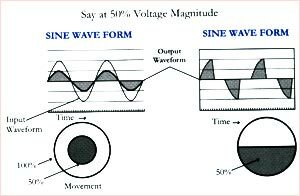 wave form distortion at any load, Electrical wave from is like a moving wheel. For 50% Rated Voltage the Dia of wheel is reduced accordingly i.e magnitude for a wave is decreased. Wave form distortion in thyrsorised type, It is like cutting the wheel by 50% and then moving the wheel. i.e wave from is cut as shown at full magnitude. Higher power factor of more than 98 is achieved . The cost of spares is very negligible. 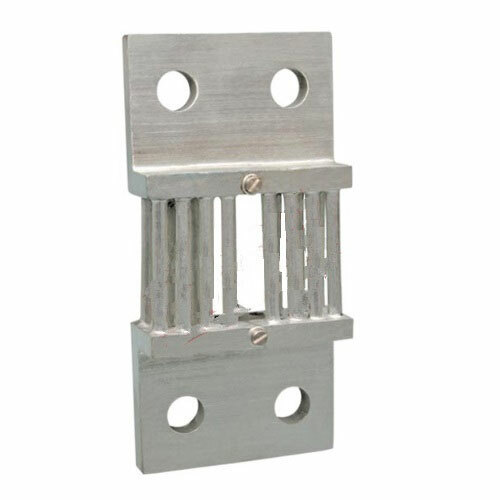 Copper section for particular current is 3 times than conventional make. Carbon roller rolls on coil and has trouble free life of more than 20 years. Over all losses are less. The power factor is lower between 0.5 to 0.75. The cost of replacement is very high. Copper section for particular current in conventional make is 1/3. Carbon brushes slide on coil, have less life due to sliding on coil & breaks regularly. Over all losses are more. 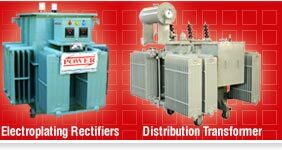 We manufacture and exports the wide range of Basic Circuit of Electroplating Rectifier.